Congratulations on getting your braces off! Now that orthodontic hardware doesn’t cover your teeth, it’s easier to see your new, improved smile. Unfortunately, it’s also easier to see areas of concern, like the white spots you mention. Pale, opaque areas on your teeth are oftentimes the result of “demineralization” — the first step in the process of tooth decay. The chalky appearance of these white spot lesions (WSLs) is an optical effect caused by mineral loss underneath the tooth’s surface enamel. This is the result of acids left in contact with the tooth surfaces, which dissolve out calcium and other minerals. The acids are produced by bacteria when they break down sugar in your mouth. WSLs can occur when the teeth aren’t cleaned well enough to remove biofilm (plaque), allowing bacteria to collect on the teeth and gums, and around difficult-to-clean orthodontic brackets. The chalky appearance of these white spot lesions (WSLs) is an optical effect caused by mineral loss underneath the tooth’s surface enamel. WSLs can develop quite rapidly in people having orthodontic treatment, and are often seen in areas near brackets and bands. The process is aided by poor dietary habits: snacking frequently, and drinking beverages high in sugar or acids, such as juices, sodas, “sports” and “energy” drinks. Sodas (including diet varieties) usually contain phosphoric acid, which can wreak havoc with your teeth (especially if you drink it every day) by eroding the enamel on contact. What can you do about WSLs? As you may have discovered, braces can make it extra-challenging to keep your teeth really clean, because the brackets and wires may get in the way of your brush and floss. That’s why orthodontists always stress how important it is to make the extra effort. 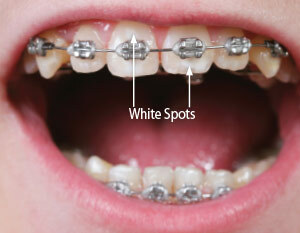 While you’re wearing braces, there are several things that can be done to prevent white spots. First, keep up a high level of oral hygiene. In addition to normal brushing and flossing, there are special brushes that can be used to clean around orthodontic brackets and wires, and floss threaders to help you work with dental floss. You can also try using a “water flosser” to flush material from between teeth and beneath the gums. This works by pulsating water at high pressure through a handheld device that looks something like a power toothbrush. There are also some professional therapies that may help if you are at high risk for developing WSLs. These include at-home use of prescription fluoride toothpastes or rinses, or in-office application of fluoride gels, sealants or varnishes. While these methods can produce improvement, the effectiveness of particular treatments is still being studied. There’s yet another way to keep white spots from forming, and even potentially reverse their damage: Keep the environment of your mouth healthy! It’s well known that acidic and/or sugary foods and beverages cause demineralization and erode tooth surface enamel. If you choose to consume these products at all, it’s essential to limit them to mealtimes and avoid between-meal snacking. That gives your saliva — nature’s own acid neutralizer — enough time to do its work. You can help here, too: Keep your mouth moist by drinking plenty of water, and by avoiding tobacco, alcohol and caffeine. If your mouth does get dry, try chewing gum or mints that contain xylitol; these promote salivation, and can help reduce the risk of tooth decay. What if you already have white spot lesions? Fortunately, many people find these areas stay the same or get better with no specific treatment. However, there are a number of ways to treat WSLs. One approach focuses on re-mineralizing the affected tooth surfaces. This process can occur naturally, or can be helped with over-the-counter or prescription fluoride pastes and gels. WSLs can also be improved with professionally applied fluoride and re-mineralizing agents in the dental office. A procedure called microabrasion, which helps to restore damaged areas beneath the tooth’s surface, may also be effective. A newer technique, known as “caries infiltration,” involves injecting a liquid tooth-colored resin beneath the surface enamel in the area of the white spot, and then hardening the resin with a curing light. This makes the spot less opaque and more translucent like normal enamel. Yet another promising new technique uses short bursts of laser light to inhibit demineralization and prevent cavities from developing. If these treatments don’t work for you, or if you’re unsatisfied with the appearance of your teeth, conventional cosmetic procedures like bonding or veneers can bring your smile up to the aesthetic level you desire. White spots are frequently an issue both during and after orthodontic treatment — and even for some who don’t wear braces. If you notice them, don’t hesitate to talk to your orthodontist or general dentist right away! He or she can recommend the best way for you to deal with WSLs.